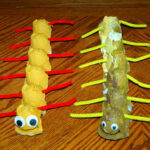 My son has been “all crafted out” lately. I think with all the review I did with him last week and starting Kindergarten tomorrow, he is just ready for me to leave him alone. Hahaha! 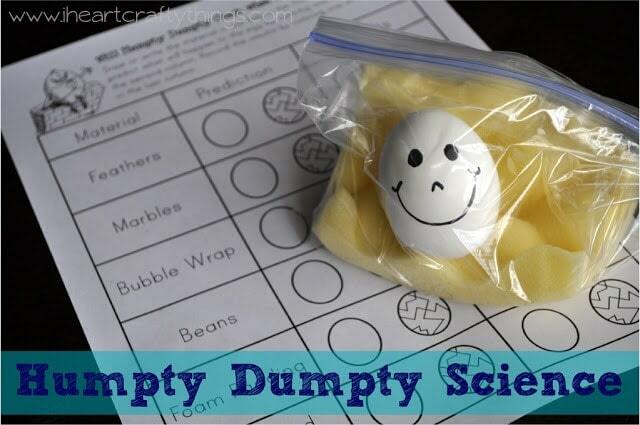 So instead of a craft today I decided to keep it light hearted with some Humpty Dumpty Science. This definitely turned out to be as fun as I thought it would be. 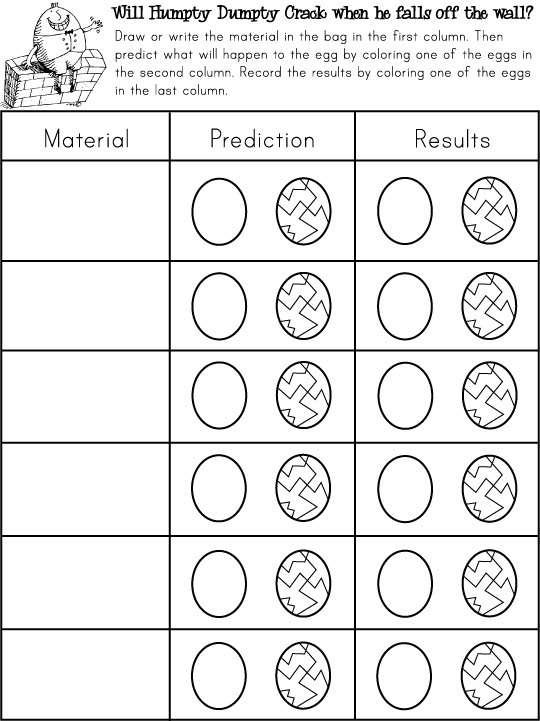 I created a worksheet for this activity which you can download and print HERE. 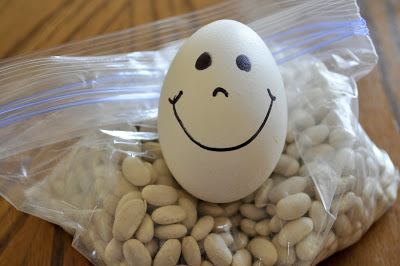 The object of this activity is to predict whether or not Humpty Dumpty (hard boiled egg) will crack when dropped off the wall surrounded in different materials (feathers, cotton balls, etc). 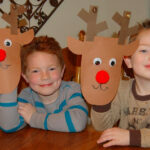 It is also a great activity for helping kids memorize the Humpty Dumpty Nursery Rhyme. Start by hard boiling 6 eggs and set them aside to cool. After they cooled down a bit I put mine in the fridge to speed up the process. 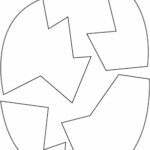 Once the eggs are cooled, use a permanent marker to draw faces on them to represent Humpty Dumpty. Then gather 6 sandwich bags and fill them with different materials. 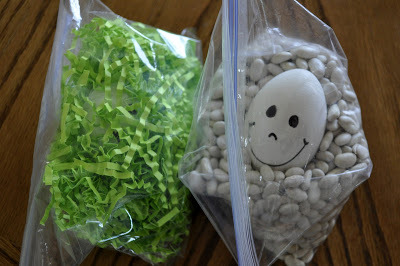 We used marbles, a piece of foam padding, bubble wrap, feathers, shredded paper and beans (all pictured below). 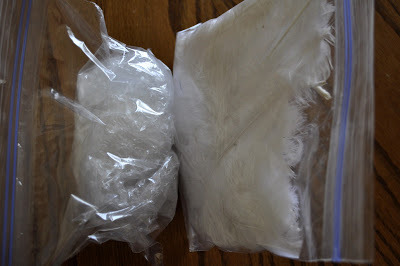 Now I had my son feel all of the materials in the bags and we discussed if they were soft or hard, heavy or light, etc. 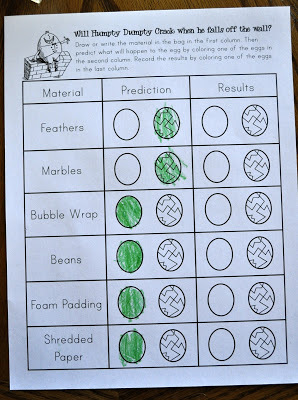 Then he made his prediction on the worksheet of whether the egg would crack when dropped in the different bags. 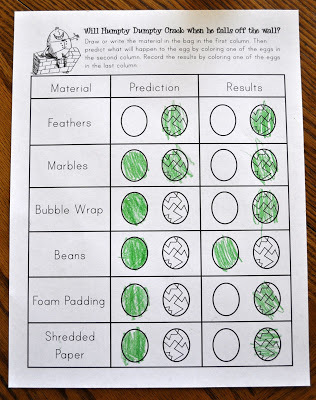 To make his prediction he colored either the smooth egg or cracked egg in the correct column. Now comes the fun part! 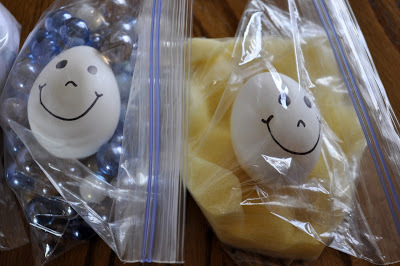 Put the eggs into the bags and as you repeat the nursery rhyme, have your child drop a bag from the table when Humpty Dumpty falls off the wall. Repeat with every bag. 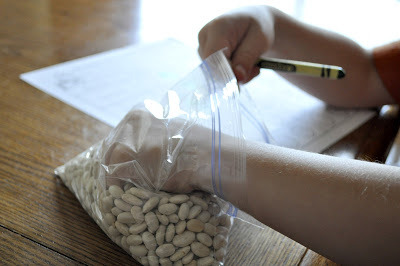 After dropping all of the bags, remove the eggs and record the results on the worksheet. We were definitely surprised with our results. 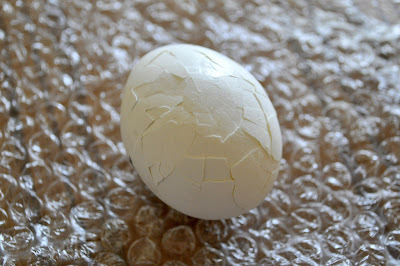 I thought for sure the bubble wrapped egg would have survived the fall, but it cracked. Maybe I should have put a couple more layers around it. I thought the egg on the foam pad would survive also, but it cracked. 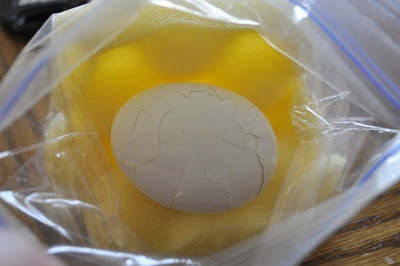 I even made sure my son dropped it straight down so the foam remained underneath the egg. I LOVE this! It sounds so fun! I'll have to remember this for our nursery rhyme unit. Thanks for sharing! What a fantastic idea!! 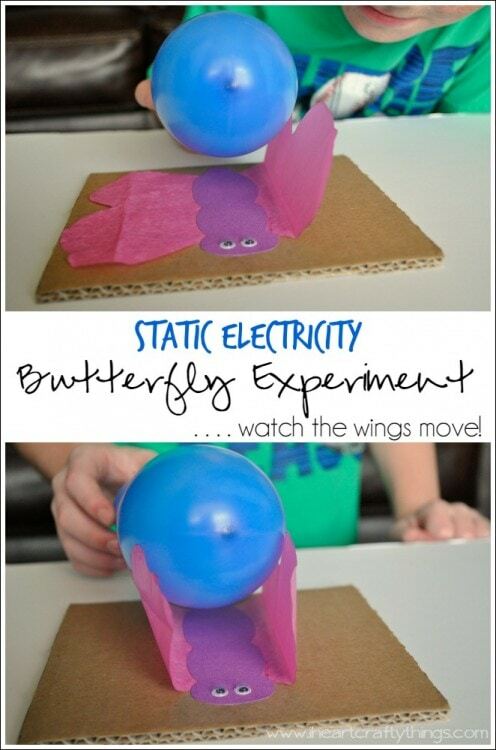 You are so awesome Rachel 🙂 My kids would love this idea, thanks so much for sharing the worksheet too. Oh and Hello!! Your blog looks awesome!! I love the new look of it. This is awesome! It also brought back memories. In high school physics we had to design something to hold our egg in hopes of the egg surviving the drop from the top of the football bleachers. Great project!!! How high did you drop the eggs from? @vida Vida, We dropped the eggs from our kitchen table. It's just a standard height table, not the taller type. This is an AWESOME idea. 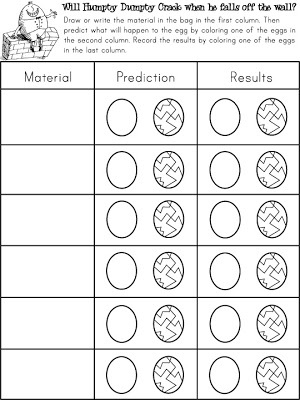 My son loves when we do science in preschool, but I always have a hard time coming up with something to match our themes. Thank you so much! This was so great! Did it today with my 8 and 5 year old. We used cooked bow tie noodles, dried lentils, cotton balls, popcorn kernels and uncooked rice. My 2 year old loved us all saying the Humpty Dumpty rhyme too!